The weather won't be warm enough to go barefoot at the beach for another few months. I don't have to wait that long to decorate my skin with henna style, though - look at the dahlia flower necklace that bloomed in my mailbox, despite the cold! According to the jewelry artist, Julia of Eternal Girl, flowers represent joy and happiness in henna tradition. Wearing her hand-drawn pendant certainly evokes those feelings for me. Her henna-inspired art is secured in an antique-styled, bronze pendant with a round glass covering and hangs from a bronze metal chain. We could all use a little joy and happiness in our days, right? I think so. Wow, that is SO cool! 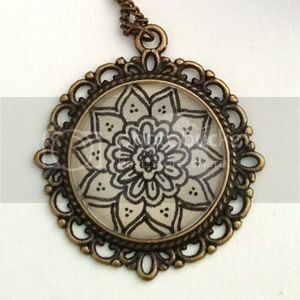 I love the idea of drawing henna designs on a necklace. So creative. Very beautiful! Her art makes a lovely pendant! Beautiful necklace. I love the henna design, so creative. I like it very cool!! !